When the current owners acquired Urban Burger, they set out create a brand that is more than just your ordinary burger joint. This required them to set themselves apart from not only other restaurants in the area, but to some extent the previous Urban Burger owners. The website was a huge part of their rebranding efforts. The challenge came in incorporating various elements of their business and personality into the website without making the website feel cluttered or making any aspect feel out of place. 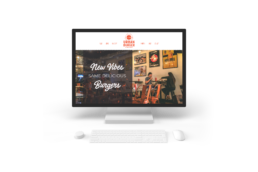 The homepage for the website was instrumental to us in crafting the story of Urban Burger and making each aspect of the website and business feel core to what Urban Burger is. 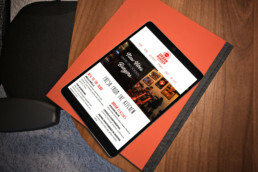 To that end, we included some of the unique aspects of their business, like their t-shirt store, front and center on the homepage alongside the information you’re more likely to expect, like the menu and store hours. The top banner on the homepage switches out periodically, to reflect the restaurants new menu items, new shirt designs, upcoming menu items, and other happenings in the restaurant. Early on, we knew that photography was going to play an important role in the Urban Burger website. It’s one thing to read what is on the Wicked Blue Burger, but seeing a photo of the burger, with a stack of onion rings on it between two buns, is an entirely different story. With a diverse menu of different options, it was crucial to organize it in a simple way that didn’t make the menu feel too long or complicated. By separating the menu into different pages, we are able to accomplish this goal, while giving ourselves plenty of space for all of the delicious photography. As we mentioned, there is more to this website than most other restaurants. With a shop, events, blog and curated playlists needing to be included as well. The navigation bar provides a subtle separation of the food aspect of the business from the rest of the brand, helping guide visitors to the information they are most interested in. Feel free to visit Urban Burger’s website by clicking here. Or stop in and experience one of their many amazing burger selects.